Today’s the day when young people (and perhaps a few older ones) will dress in costume and go trick-or-treating. If your house is like mine, costumes have been discussed and debated since late July…or since the first catalog featuring costumes appeared in the mailbox! 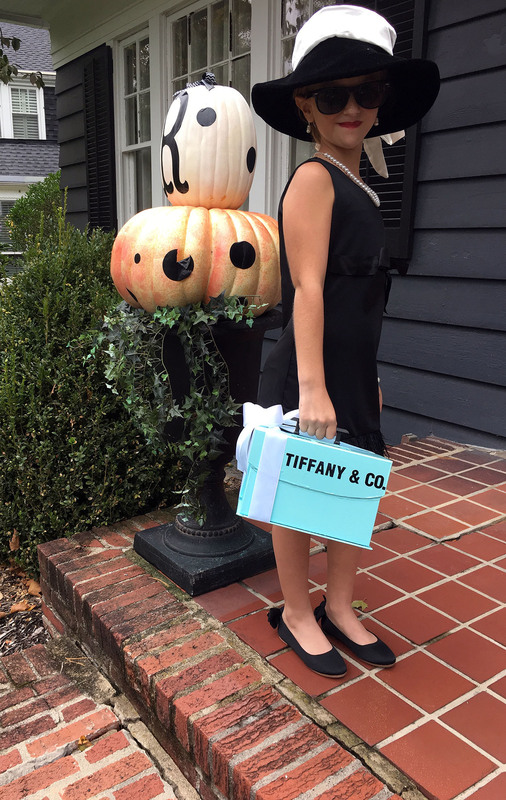 After narrowing it down to “a few” and consulting with her older sister who is away at college, Claire decided to be the iconic character made famous by Audrey Hepburn…Holly Golightly from the movie Breakfast at Tiffany’s. She loved the costume, hat, and sunglasses from Chasing Fireflies (click here for details). In fact, she said she could just wear the dress after Halloween and no one would even know it was a costume! We added these shoes from J Crew; and because we live in Ohio and you just never know what the weather will be for Halloween, we found this classic-style black faux-fur jacket. We have had years when the temperature has been in the 70’s on October 31st, and I can recall one year when it snowed three inches, so it’s always good to be prepared. Some pearl jewelry completed her costume! 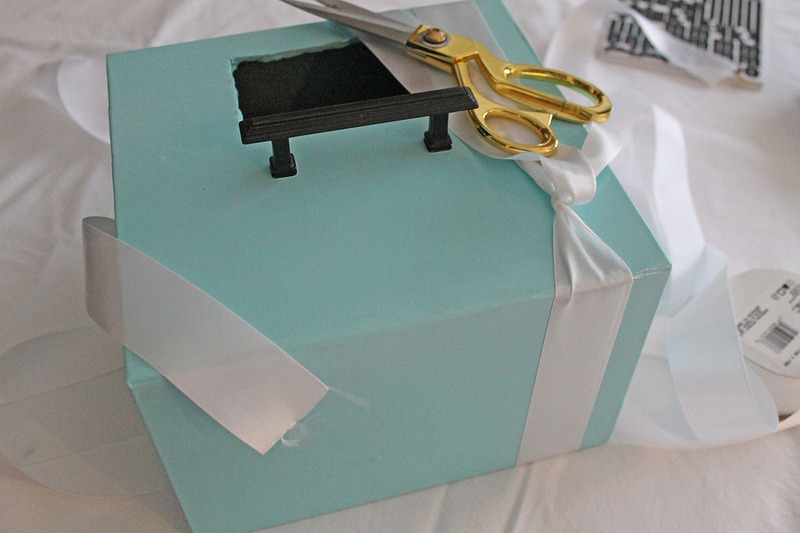 When you think of Tiffany’s, you can’t help but think of the “little blue box.” I thought it would be fun to add just one more accessory to Claire’s costume, which could also double as a container in which to collect her treats. 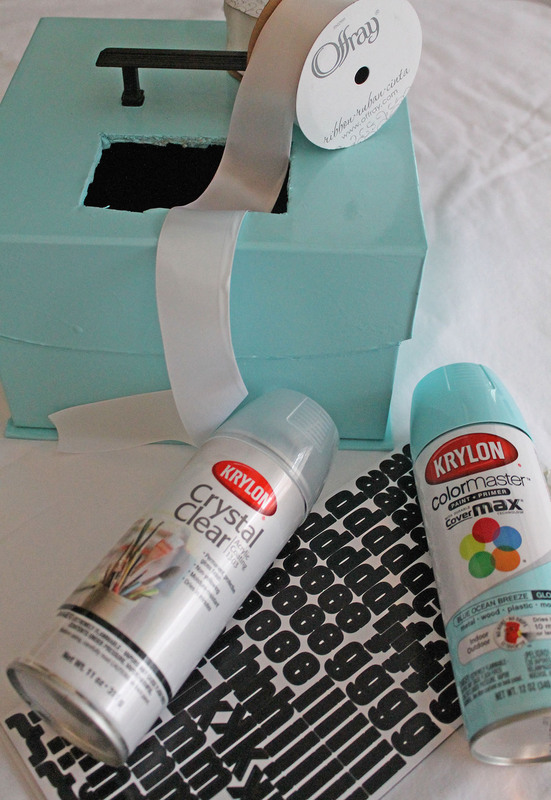 I gathered some supplies…a durable square-shaped box, blue spray paint, clear coat spray, black alphabet stickers, white ribbon, and a black handle. I cut a hole (don’t look too closely…it’s a bit jagged) in the top of the box, making it easier for her to put her treats inside. 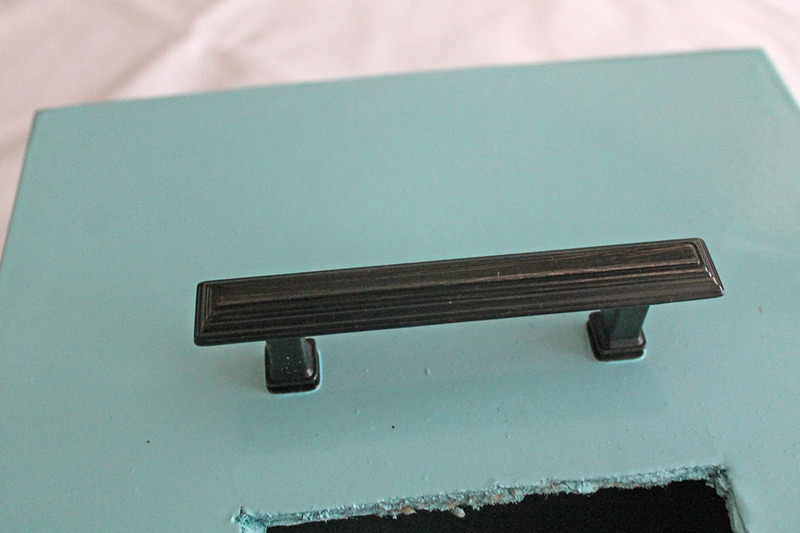 Then, I applied three coats of the blue paint and a clear coat to seal it. The black handle was attached. 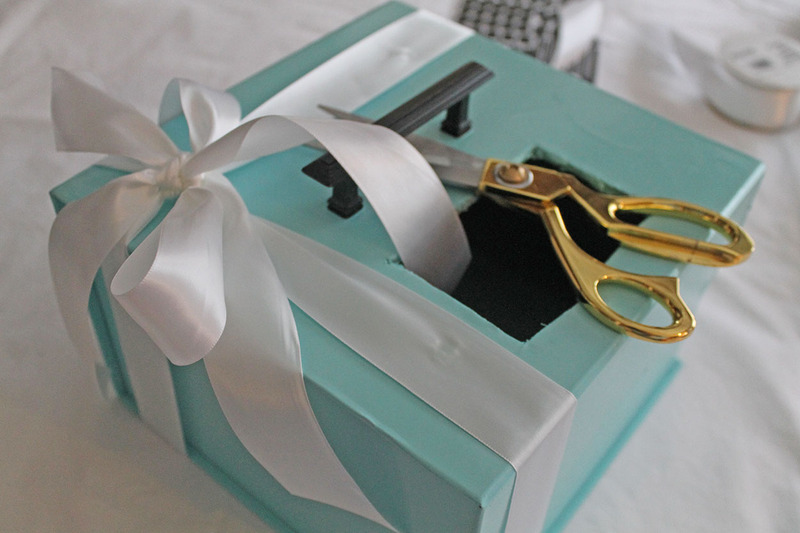 I tied white satin ribbon around the box. 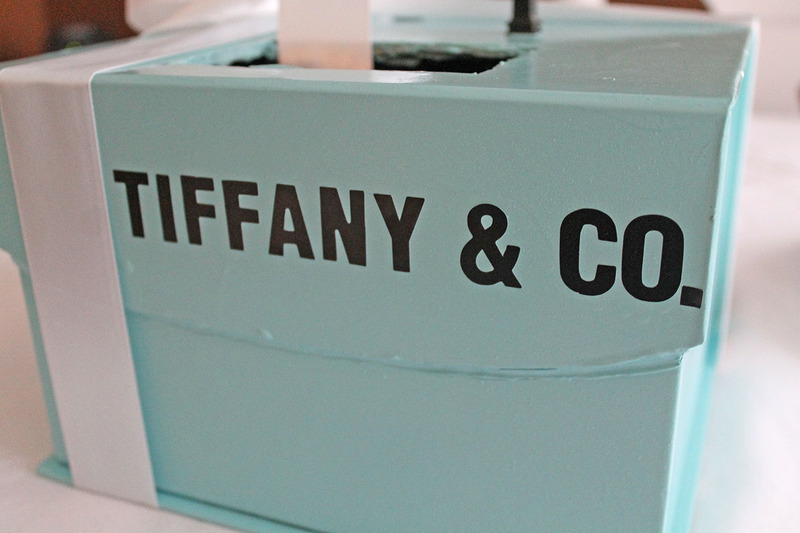 Finally, I placed the letters on the box…TIFFANY & CO.
NOW the costume is complete! She loves this costume because she can wear some lipstick with it! Thanks, Christi! An easy and comfortable costume!! !